NPO’s, with Christmas around the corner, it’s time to get festive with your fundraising! Don’t miss this once-a-year offer from Shoprite, Checkers and Checkers Hyper to jump on the sleigh and up your donation count! Here’s how to connect your cause this Christmas. The tradition of charities wrapping gifts in exchange for customer donations has become synonymous with Christmas at Shoprite and Checkers stores, and that time of year has rolled around again! The retailer is sounding the trumpet, welcoming registered charities to apply for this annual festive season fundraiser. 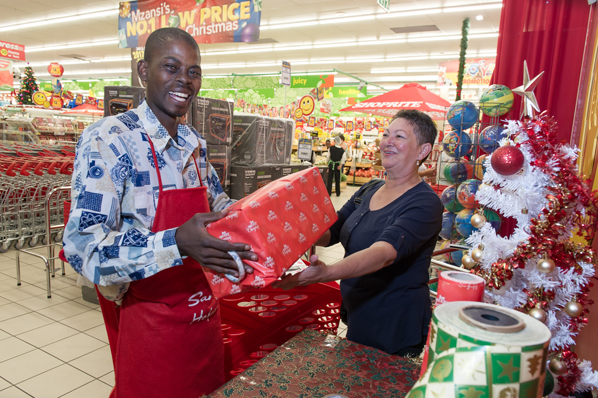 Each year, hundreds of qualifying charities have the opportunity to man in-store gift wrapping stations at 577 Shoprite, Checkers and Checkers Hyper stores across South Africa. Here twinkle eyed customers can have their gifts wrapped in exchange for a small donation. Complete the online application form before Friday, 2 November 2018. Attach a copy of the NPO representative’s South African ID or passport and the NPO’s certificate. It’s just that simple! Sign up your NPO today to get involved in this gold dusted opportunity. Are You a Young South African? Apply Now For The Global Citizen Fellowship!